Laurie from Camarillo, CA wrote to tell me her father-in-law, who spent most of his life in Wilmerding, PA, passed down an original oil painting by H. Lewis to her husband, Jim Stirone. It had been hanging on the living room wall for most of Jim’s life in his father’s home. This particular painting was not dated with a year, as most aren’t. 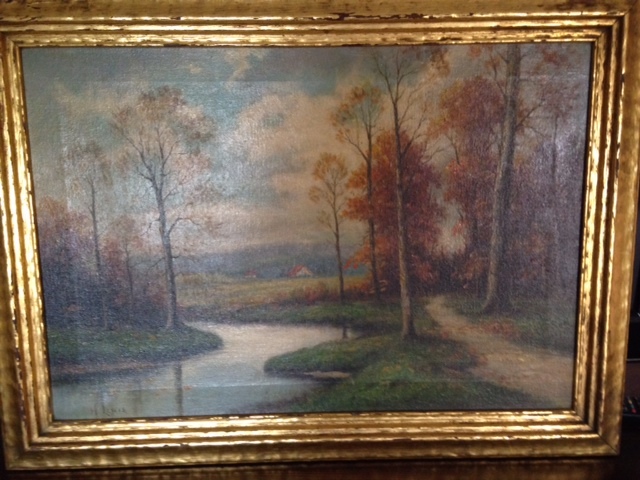 The painting is a landscape of an autumn day, with a winding path along side a winding still creek. Hubert often incorporated water into his landscapes. Thank you for sharing photos of the painting, Laurie. I enjoy showing my great grandfather’s work. This entry was posted in The Art and tagged 19th century art, 19th century artist, American artists, Fine art, H Lewis, H. Lewis art, H. Lewis artist, h. lewis signature, H.R. Lewis, HR Lewis, Hubert, Hubert Lewis, Hudson River School, Kim Lawler, Painting, Pennsylvania. Bookmark the permalink. I have three paintings by Hubert Lewis. He was married to my grandmother’s sister, Sadie. We have a portrait he painted of my grandmother, Florence Benjamin Blair, a campfire painting that he gave to my aunt and uncle for their wedding gift, and a beautiful ship painting. I would love to know if there are any of his paintings still for sale. I was so excited to discover pictures of his other paintings and learn about the family! I have a H Lewis painting of a cottage with long flight of steps and flowers. Interesting to find other H Lewis paintings on line in same frame. It was my late husbands parents and I have reason to believe that it was given to them as a wedding gift by a close friend who was from Scotland. 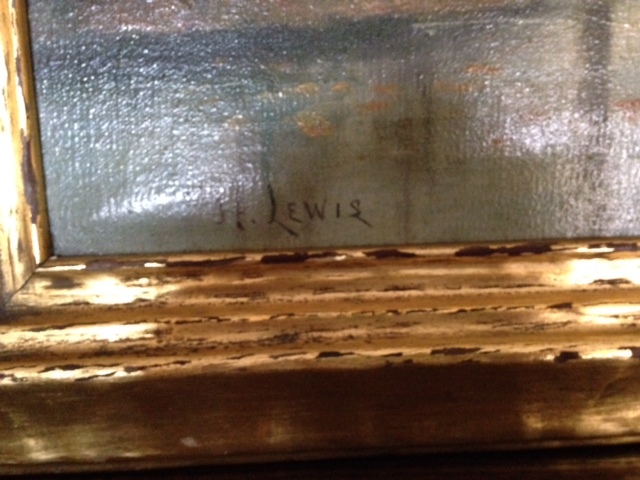 The friend from Scotland that have your in-laws the painting as a wedding gift may well have been Hubert Lewis. It seems he gave his paintings as gifts to family and friends. How lovely you still own it.